All things being equal, the number of reviews and the quality of your reviews will attract more customers. Studies show that 40% of the buying population pays very close attention to what others have to say about your business. Truthfully, I think the number is much higher than that. There is a really cool thing that happens on Google Maps when you generate 5 reviews. Once you reach that magic number, Google shows little gold stars next to your business listing. It’s another way reviews help you stand out in the crowd. 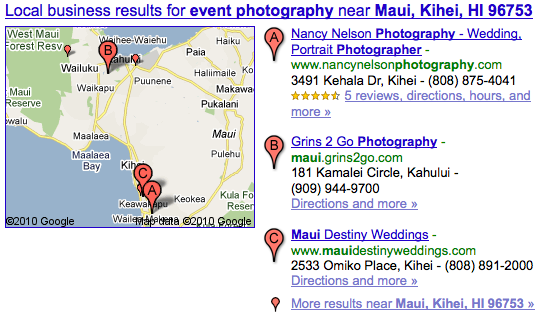 Look at this example for the term “Event Photographer Maui.” Notice how Nancy Nelson Photography stands out. It doesn’t hurt that she’s in the top spot either, but honestly, even if her business was in the last spot on the map, I would still be more likely to click on it first. Standing out is not just about generating lots and lots of reviews. You must have as many 5-star reviews as possible. The better the reviews, the more likely people will be to contact and hire you. I encourage you to read my article on “5 Star Business Reviews: How To Get Them” before you get started. If you have a bad review on Google or on another site, there are a few things you can do to get them removed from your listing. Please read my article on “Getting Bad Reviews Removed” if this is an issue for you. One of our customers is Regal Car Rental in Ft. Myers Florida. The owner knows the importance of getting great reviews and he does a wonderful job of generating them. To date, all of his reviews are 5-star reviews. Regal Car Rental is in the number one spot for the term “Cheap Car Rentals Ft. Myers FL,” not because Tom rents cheap cars, but because this is a highly searched term and he wants to get in front of the people looking for inexpensive rentals. After seeing this review, it gave me a wonderful idea. People tend to look for bad reviews first to insure that they don’t get ripped off. A great way to give these people what they’re looking for is to encourage one of your happy customers to title their review in such a way that the reader doesn’t know what to expect … but is delighted once they read the review. I can’t tell you how often we hear this from our customers. Once you generate a significant number of positive reviews, you will hear this from your customers on a frequent basis. It’s my top reason for selecting a service provider and it’s the decision making process used by millions of others too. If you’ve been putting off generating positive reviews from your customers, don’t delay any longer. Reviews may or may not help you get top placement in Google or any of the other highly searched sites, but there’s no question that great reviews will convert lookers to buyers.